AiPT! 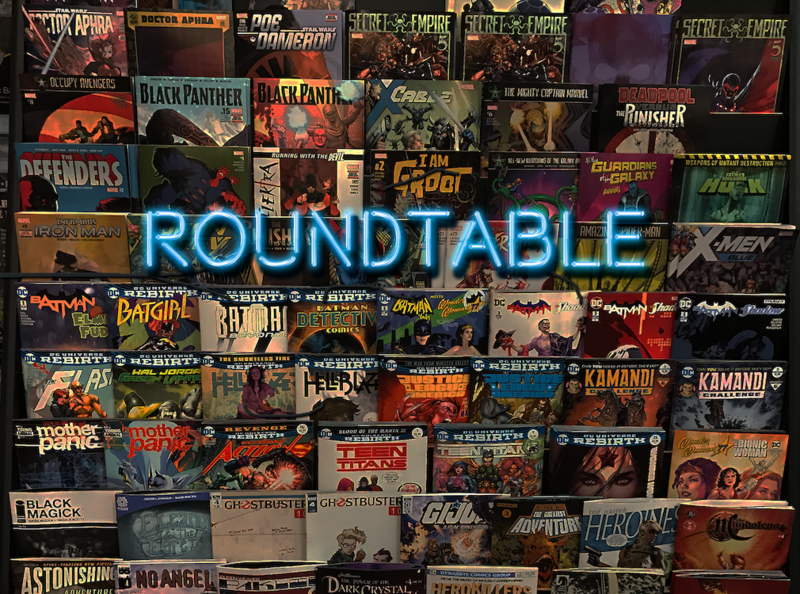 Roundtable fixes the comic book industry – AiPT! You can feel it. There’s something in the air. After years of continued growth, in defiant opposition to most other publishing trends, the comics market suddenly seems … soft again. Sales are down so far this year and whispers of customer dissatisfaction abound, but how nervous should fans and retailers be, really? And if there is a problem, what can we do to fix it? In this special edition of Roundtable, in addition to our own fan and amateur market-watcher Liam Nolan, we’ve reached out to retailers Michael Welch of Newbury Comics in North Dartmouth, Massachusetts, and Peter Dolan (also president of ComicsPRO) of Main Street Comics in Middletown, New York, as well as wrangler of Comichron sales statistics John Jackson Miller and Forbes contributor and author of Comic Con and the Business of Pop Culture, Rob Salkowitz. As we survey the breadth of everyone invested on the issue, fans and professionals, we’ll surely agree on everything and the strategies we suggest will SURELY be taken up enthusiastically by everyone in the totally non-stodgy comics industry. Secret Empire … has not lived up to sales expectations. As we reach the end of 2017’s summer, many people are worried about the health of the comics retail market. How did we get here? Reliance on variant covers, too little talent? Or is it really not as bad as some people think? Liam: I feel like there are a number of problems with the industry that are liable to make things worse if they go unchecked. Obviously the big one that gets a lot of press is events, which bring in a lot of money but may actually be hurting sales as a whole. There’s also the problem of marketing, which often feeds more money into bigger books that might have sold well anyway while allowing great, small books to effectively die on the shelf from under-exposure. It’s also difficult to get into comics, and that’s keeping new readers from jumping on. While both Marvel and DC have tried to use new #1s to entice readers, they often still exist within continuity, so they end up being frustrating for new readers. Comics are also incredibly expensive compared to the actual amount of time a purchaser gets with them, so there are a myriad of problems that have been pushing out existing readers while also making it hard for new readers to make up the loss. Peter: I think the biggest problem in our market, and the biggest challenge facing retailers, is the sheer amount of titles that are being offered. It’s difficult for retailers to curate their stores with the vast amount of offerings, and in turn, it’s difficult for fans to identify the books that will resonate with them. Michael: I don’t think it’s as bad as some others might. People call for the death of comics every day, and I also feel that those people just like to complain, which is an unfortunate side effect of the online culture. Our store is thriving in comic sales. Like everything else in style, this is cyclical, and we are still experiencing a boom … To me there is no problem with creator talent, as there are always new writers and artists springing up out of indie titles and gaining followings before moving up to the bigger companies (and bringing most of their following with them). John: Markets are rarely as good or as bad as people think. The market’s metrics are full of month-to-month comparisons — which aren’t even because any book will sell more in a month with five Wednesdays than with four — and year-to-year ones, which suffer the same problem, plus force comparisons with a market that may be at a different point in its product cycle. For example, June was off both because it compared its four weeks with a five-week June 2016 — and because at that time last year both Marvel and DC’s big editorial events for the year were launching at the same time. This year, the events are spread out more chronologically. Markets are rarely as good or as bad as people think. Rob: It’s not the state of the comics market in general that has people worried. Trade and bookstore sales are doing great. Digital seems to be fine. It’s the direct market that’s the problem. Most comic shops are independently-owned small retailers, and the economy in general is not good for anyone in that space. Rents and labor costs are going up, online competition is mounting, and there’s very limited opportunity for comic retailers to recoup those expenses because the price is marked on each comic, and their margins are locked in by Diamond. Furthermore, when you look at the sales trends in the last few years, if you take out Star Wars and Batman, pretty much the entire periodicals business is on life support. Longtime DC and Marvel fans are not responding as well to big “events,” especially when the publishers under-deliver creatively. There are practically no hot artists capable of generating interest on their name alone, if you leave out perennials like Frank Miller. In the indie space, there’s almost too much quality. I love what Image and Dark Horse are doing, but there are too many titles for me to follow month to month; even if I had the money, I don’t have time to keep up with everything, especially with so much other entertainment competing for my attention. I don’t think I’m alone in that. The gimmicks like lenticular covers and variants make a difference at the margins, I guess – some stores say that having even 1-2 collector-oriented customers who pay premiums for those things are important when it comes to making the payroll. Hey, those “Button” covers sold pretty well. But how long will those buyers be around? What can be done about it? Change in story direction? More focus on those stories, rather than marketing? What about market segmentation — different books for different channels? Or different formats? Liam: There really is no one thing that can be done to fix the comics market and get it back into the shape it was in previous decades. We don’t live in that world anymore. What we have to do is look forward and figure out the best possible way to get comics into the hands of readers. I think the main avenue for that is bound to be trade paperbacks and further emphasizing arcs as collected editions rather than monthly/bi-monthly floppies. Because of the associated costs, I also think that means leaning more heavily into digital distribution and finding a way to offer a discounted rate. Michael: If anything is hurting sales, it is the constant shakeups in creator teams and storylines in Marvel and DC. Relaunches are now tiresome and seemingly constant. The content and quality will keep more readers than a gimmick. I think Marvel and DC are playing the short game continuously but if they looked at the forest rather than the trees, I think they’d be more profitable in the long run, and shops would benefit as well. Peter: Ultimately, content is king. A couple of good, solid hits for any publisher will help focus fan (and retailer) attention to their line(s). When the big guys are slumping, it’s a golden opportunity for smaller publishers to grab a bigger piece of the pie. Weekly comics customers love their hobby. They love regular installments of their favorite stories. Savvy retailers should be able to identify books that might not be in their customers view, and point them out to them. Rob: I think it’s a good sign that DC is giving creators a share of the new characters they’re developing for the “Metal” event. When the corporate publishers demand complete ownership of their IP, it brings real creativity and innovation to a stop, because who wants to be known as the guy who invented the next Wolverine or Deadpool, then never saw another cent? Rob Salkowitz cites Valiant has a publisher with the right idea — a finite shared universe with tight writing. In terms of graphic novels in bookstores, it’s time to break down the “graphic novel” ghetto and get graphic works on the shelves alongside prose in the categories that make sense. Put Peter Bagge’s biography of Margaret Sanger in biography or gender studies. Put Nick Sousanis’s Unflattening in the Education section. Put Emil Ferris’s My Favorite Thing is Monsters on the literature shelf, face out. That will help mainstream, non-comic readers widen their horizons and maybe get them into comic stores to find a wider assortment and more knowledgeable sales help. Cons are selling experiences rather than stuff. To the extent retailers can survive in this climate, they need to embrace the social component of fandom. Here in Seattle, a bunch of stores offer game nights, book clubs, art gallery-type events, drink-and-draws and other things to bring people in for the good vibe and a good time with friends, not just to get their weekly fix. But those require investment, and dollars are getting scarce.